Attention all you Dallas Cowboy Fans. Check this awesome quilt out that Loraine made for her nephew. I think the pictures of the Quilting Eye Candy speak for themselves. At one point I called William out to the studio to get his opinion on what to quilt in one of the sections. His only comment was "that's a lot of stars on that quilt". What else would you put on a Cowboys Quilt, certainly not feathers!? Or at least I didn't think so. 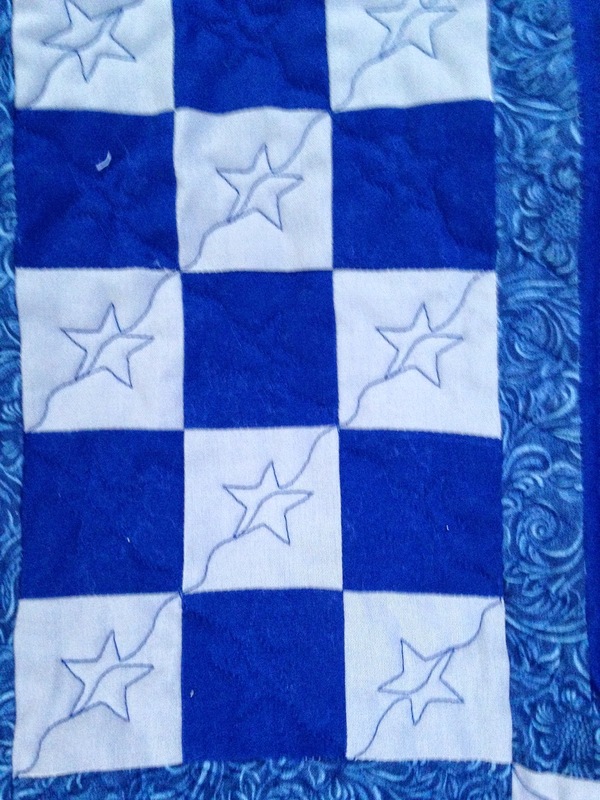 The star in the center and the 4 corners Loraine says are paper pieced. Look closely and you'll see the football quilted in this block. I'm not even a Cowboys fan and I liked the quilt. 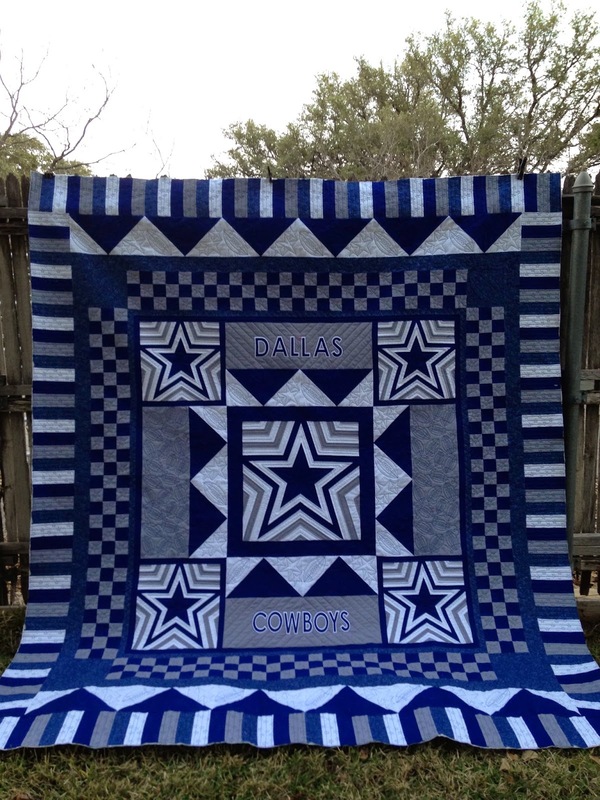 Love your Dallas Cowboys quilt! I really like how you quilted that ! AND your website looks nice ! Awesome quilting Doris! It really makes the quilt pop! Do you know of anywhere I could buy the star pattern? I love this & the quilting is amazing! Wow! 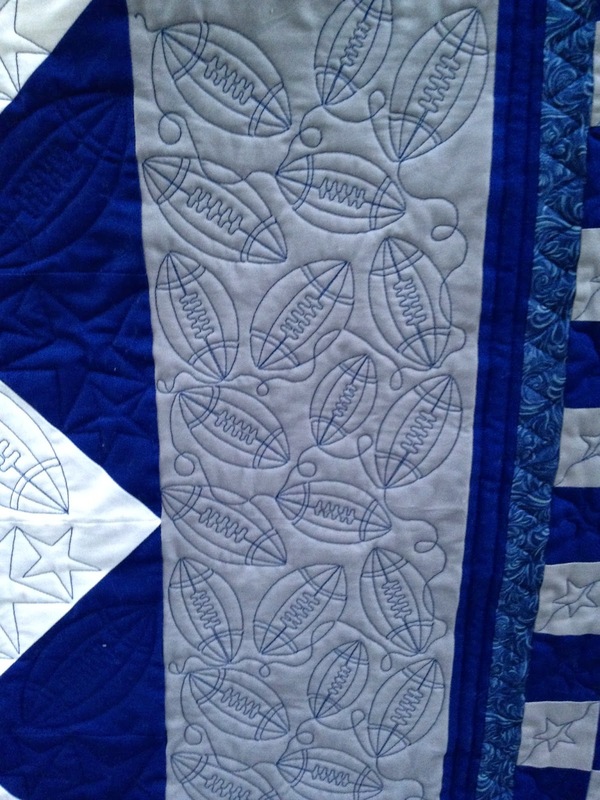 Absolutely the most awesome Dallas Cowboy quilt I have seen. My grandson has been begging me to make one for him. Would you be willing to sell your pattern? Great design and small threading details. Love the eye-catching (almost 3D) main star in the middle. Very striking! I would love to have the pattern. how do I get the pattern? I would love this pattern. I have a good friend retiring from the Army andvus a huge Cowboys fan. love the quilt, is there a pattern ? Please send me info about a pattern. Thanks. How can i get in contact with you about buying this quilt? ?